Google has announced a Play Store update that brings in many improvements like better in-app buying protection, the ability to batch install apps, relocated Settings and Help menus, and more. The folks at Android Police were first to spot the update, which bumps the app up to version 4.6.16. One of the biggest changes the update brings is the new “Require password” feature which will allow users to password protect purchases on the Play Store from a particular device. The feature provides three options: never, every 30 minutes, and for every purchase. The last option is particularly useful for those who do not want their kids to do in-app purchases without their permission. Up until today's update the Google Play Store would ask for a password just once per 30 minutes. This limitation recently resulted in a woman suing Google after her kid bought $66 worth of in-app purchases on Marvel Run Jump Smash. 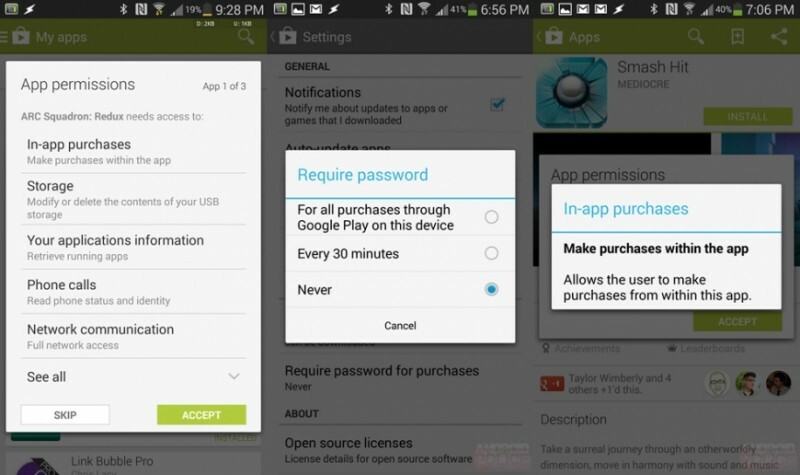 Aside from offering greater control the Play Store will now also provide an in-app purchases indicator under the 'App permissions' screen when first installing an app, letting you know beforehand if it includes the feature. Another welcome change is the addition of a batch install feature that will help you quickly install multiple applications on a new device. The update also includes the option to trigger a self-update on the Play Store itself by tapping the Build version in settings, while the “Auto-add widget" setting has been renamed to a more intuitive “Add icon to Home screen”. Lastly, there are also some UI tweaks. For example, there is a white border around the profile image, account name now appears in bold, 'Add' buttons are now blue in color, among others.